The Fluke Networks 8-piece electrical contractor telecom kit is designed for certified electrical contractors. This telecom tool kit includes the basic tools needed to install and maintain telecom networks. Some of the tools and testers included are TS30 test set, impact tool, standard modular adapter, and more. 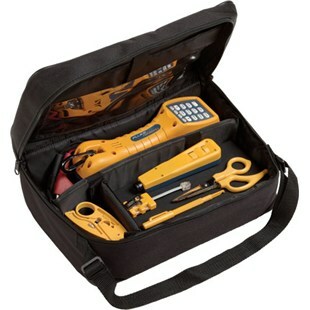 The Fluke Networks electrical contractor telecom kit stores all of installer tools and testers in a convenient zippered tool case. 18 months manufacturers warranty. Click the button below to add the Fluke Networks 11290000 Elec. Contractor Telecom Kit to your wish list.